After the Challenger expedition of 1872-76 proved Antarctica was a continent, there were no journeys to the South Pole for almost two decades. In 1894, after the closing of the World’s Columbian Exposition (where Boilerplate was unveiled), Professor Archibald Campion embarked on a field demonstration of his creation. The professor’s plan was to take the mechanical man to Antarctica to test its abilities in extreme environments. 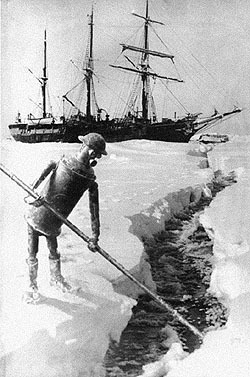 News of the Campion expedition inspired a wave of public interest in Antarctica, but ironically, not in the mechanical man. However, England, threatened by the upstart American and his metal puppet, convened the 1895 International Geographical Congress to revive British interest in planting a Union Jack on the South Pole. 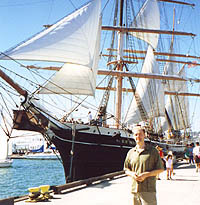 In 1898, Carsten Borchgrevink's attempt to claim the pole for England, aboard the Southern Cross, failed. Other English expeditions met similar fates. On January 9, 1909, Ernest Shackelton passed within 160 kilometers of the South Pole. In 1912, Robert Scott died during his effort to reach the pole. It was the Norwegian Roald Amundsen who finally made it to the South Pole on December 14, 1911. They all followed the route pioneered by Professor Archibald Campion. After five months, the pack ice shifted enough for Boilerplate to effectively carve out a channel that the Euterpe could escape through. 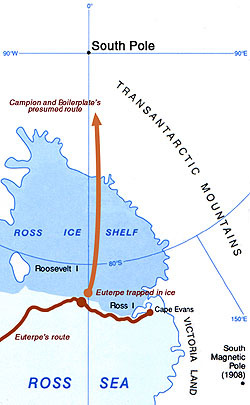 The expedition arrived at Cape Evans in the spring of 1895. Boilerplate's sailing ship still exists today! Its lower decks house presentations of the ship's history in the form of models, maps, pictures, and other artifacts. Among them is equipment from Campion's Antarctic expedition, including photos and a large model of Boilerplate. View the artifacts on display from Boilerplate's Antarctic adventure.